Tomorrow’s the big day — we’ve got a full day of entertainment lined up at the 45th Annual Castro Street Fair. All day long, line dancing will move hearts at the Sundance Saloon dance area. If you’re a newbie, grab a friendly lesson every hour on the hour, from 1pm to 4pm. If a thumping beat is more your style, check out our DJs at Dance Alley. From 12:00pm to 6:00pm we’ll have great music, and starting at 4:30pm all DJs are going to play tag team, back-to-back, till close. It’s gonna be a great time! Throughout the day, watch the thrills of Cheer SF or enjoy the dance talents of Dolores Flow. In almost every corner of the Fair, we have sights and sounds to enjoy. 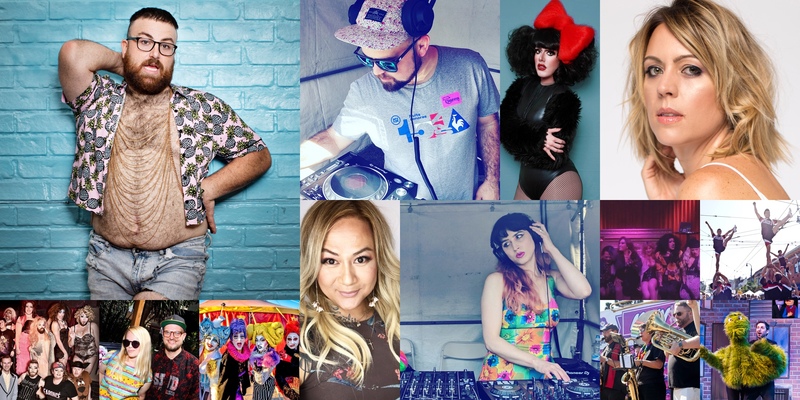 And, don’t forget the fabulous lineup we have for you on the Main Stage — hosted by local luminaries Carnie Asada and Miss J, we’ve got drag and musicals and live music and rousing speeches and a performance from “the ultimate big boy of rap,” Big Dipper. Keep our full schedule entertainment page bookmarked on your phone to make sure you don’t miss anything throughout the day. We’ll see you tomorrow in the Castro, 11am–6pm!